We stand by our patients from to prenatal care during all three trimesters, to final delivery. Pregnancy, whether it is your first or your last, is a time full of questions, preparations, and excitement! 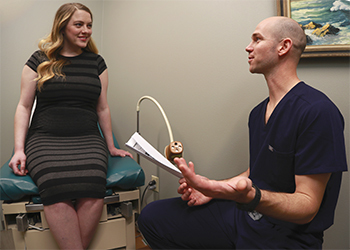 The Women's Clinic has been providing comprehensive pregnancy care to Wichita Falls area women for more than 40 years. Pregnancy often comes with a variety of different and new experiences for a woman’s body. From prenatal care to morning sickness to hypertension, the physicians and staff at The Women's Clinic are experienced in every twist and turn of pregnancy and pregnancy care. If you feel like you are in need of a fertility evaluation, please talk to your doctor. If needed, we will refer you to a specialist. One of the most common treatments for infertility is in vitro fertilization. (IVF) When a couple has been trying to conceive for a year or more with no success, we perform a fertility evaluation to determine the appropriateness of IFV. We are sensitive to the concerns of couples who are struggling with fertility concerns and we support our patients through this process with IVF or other fertility treatment options. On the couple’s part, fertility investigation, IVF, and other treatment requires a lot of time as well as physical and emotional energy. At The Women's Clinic, we work hard to minimize this difficulty. We are proud to offer midwifery care through our certified nurse midwife, Tessa Yates. If you are looking for a natural and holistic approach to your pregnancy then midwifery care is something you should consider. Midwives focus on a woman's individual needs and always take into account each patients individual goals. Please note that Tessa performs all her births at United Regional Hospital and does not perform at home or birthing center births. The physicians and staff in our office have walked the long road of fertility uncertainty with women just like you. Let us join you on this journey! Call us at (940) 723-8151 today to make an appointment. At The Women's Clinic, we are dedicated to helping our patients understand the benefits of good health before pregnancy for both maternal and prenatal health. If you are planning to become pregnant, it’s important that you let your doctor know so that you’ll be best equipped for a healthy pregnancy! Serious complications are fairly rare in pregnancy, but The Women's Clinic is equipped to handle even the rarest complications or special needs. Many women need medical assistance with later-life childbearing and prenatal care. We have extensive experience with the special reproductive health concerns of women over age 35. We help women who have a history of miscarriage, ectopic pregnancies and molar pregnancies. We also help women with a history of health problems to deliver healthy full-term babies. With years of combined experience, the doctors and nurses at The Women's Clinic have helped women with virtually every kind of pregnancy complication. We help women like you over the hurdles of pregnancy every day. Call us at (940) 723-8151 today to make an appointment.